"Old Soldiers Never Die." 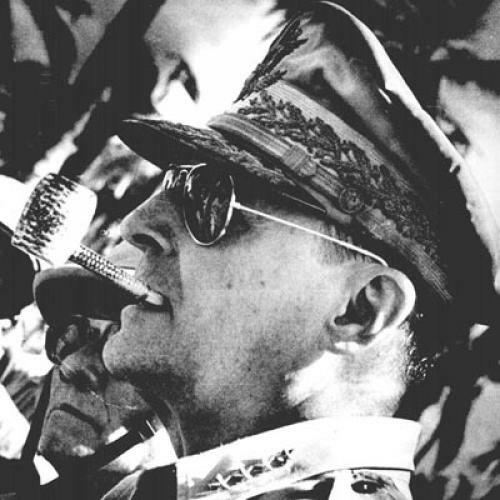 The Douglas MacArthur Analogy Fits Neither Petraeus Nor McChrystal. But That Is Probably No Comfort to the President. Our culture lives virtually without its history, which makes it a very weird culture, indeed. In France, on sabbatical a few years back, I listened to a dinner conversation about Marshal Foch. Who? Marshal Foch. How did we come around to him? Someone at the table said she'd been born in Tarbes, a small town known primarily for its proximity to Lourdes. Another guest noted that Foch had been born there. And then followed a long, discursive conversation about Foch. Everyone (except me) contributed, some a few gossipy morsels (imagine gossip 70 years after the man's death), others much deeper thoughts, including a young journalist's views on Foch's views on Napoleon. As I recall, withering. The evening ended with an argument about whose remains were next to Foch's at Les Invalides. So who was John J. Pershing? Well, there's a Pershing Square in New York … very shabby. But, suddenly, there's a lot of talk and print about General Douglas MacArthur. In Cambridge this past Saturday, a middle aged scientist said that MacArthur had been insolent to President Truman over how to end the Korean War. "And it was a good thing he was canned." I remember when he was canned. I was a child when the general was dumped, and--yes--it was a very good thing that he was dumped. He had delusions of victory when the price of victory would have been nuclear weapons. In any case, the Korean War was a very unpopular war, more unpopular certainly than the Iraq War. People were impatient for it to end. And one of the reasons they were impatient was because it was going nowhere. Still, when MacArthur, who wanted the war to go on, came home, he was greeted, well, as Pershing was--that is, as a victorious commander. Which, of course, he wasn't. Immediately upon his return, he addressed a joint session of Congress, and it was in that speech that he uttered his legendary farewell: "Old soldiers never die. They just fade away." But, before he faded away, he was feted with ticker tape and millions of cheering onlookers in several cities, the last of which was New York. I was there. My mother, a lefty liberal Zionist, was there, too, also cheering. Cognitive dissonance, one might say. MacArthur was a very complicated man. In the summer of 1932, he was deputized by Herbert Hoover, who preceded FDR in the White House, to beat up and drive out the "Bonus Army" from Anacostia Flats (then, as now, a degraded neighborhood of Washington). There were some 40,000 protesters--mostly World War I veterans and their families--who assembled in Anacostia. Some of them apparently were pacifists. Others Communists. Still others, just plain Joes. The battle was bloody. The flats were cleared. But MacArthur was not a simple or simple-minded reactionary. During the New Deal, he ran the Civilian Conservation Corps, which aimed to employ unemployed men in the work of conservation, broadly considered. He commanded American troops in the Pacific Theatre and was considered the hero of V-J Day. Taking the Japanese surrender, he set about making Japan a democratic society. No less. And he succeeded. Very well, as it happens. No mean feat. The task was gargantuan and went against the skepticism of anthropologists and social historians who doubted that the goal was possible. Except, to be sure, for Ruth Benedict, who wrote The Chrysanthemum and the Sword, a prophetic book and also a guide book for the victors. At any rate, MacArthur wanted to be president. But, by the time the Republican convention came around in the summer of 1952, the lights had begun to shine on Dwight Eisenhower, who won the election, scholars think, because he pledged that he would "go to Korea." Actually to get out. At the convention, MacArthur garnered only 10 delegates and, in the election, won all of 17,000 votes on an independent ticket. Neither David Petraeus nor Stanley McChrystal is equal to MacArthur's wizardry, if wizardry is something to which one aspires, which they do not. Petraeus has the makings of a legend. But it is conscience and not ambition that animates him. His soldiers would die for him, and so he does not want them to die for anyone, let alone him. But soldiering is often a prelude to dying. It is on his soul that the account must be put to the anvil. The president is allowed political calculations, for good or for ill.
McCrhrystal is a soldier's soldier. He goes out into the night with his men to kill the enemy, and he has killed the most brutal of them and the most random. He has no illusions about who the enemy is. Yet killing the enemy is not a sufficient goal, which is why the need in Afghanistan is for more, rather than fewer, soldiers. Otherwise, whatever cohesion there is will not hold. American soldiers and British, French, and German soldiers are the cement of war and not its explosives. The general who has raised so much ire in the civilian redoubts of the Pentagon is a soldierly monk. He doesn't need to be the archbishop. In any case, the American demos does not take kindly to usurpers. But to state an opinion is not to usurp. Or to purport. It is simply to state an opinion and, in doing so, enter into the conversation. No constitutional rule precludes generals from saying what they think.